(Montana Free Press) First and foremost among the tasks facing Montana legislators as they open the 2019 legislative session is producing a state budget — the set of bills that will ultimately direct how state agencies spend billions in public money over the next two years. The Republican-controlled Legislature will start with a proposal published this fall by Gov. Steve Bullock, a Democrat. Bullock wants the authority to spend state dollars on a slate of initiatives, including renewal of the 2015 HELP Act, which expanded Medicaid to make the public health-care program available to more low-income Montanans. 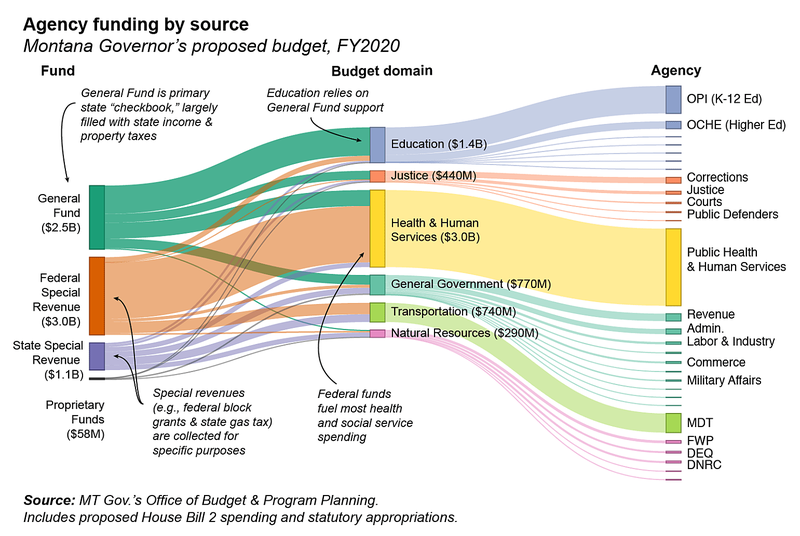 At a total of $6.6 billion in agency spending in 2020 — plus another $439 million in infrastructure proposals — there’s plenty in Bullock’s budget for legislators to work through. Spending on Medicaid, nutrition assistance (SNAP), and other social service programs administered through the Department of Public Health and Human Services constitute the budget’s biggest chunk, accounting for approximately $3 billion, much of which is federal funding routed through state government. 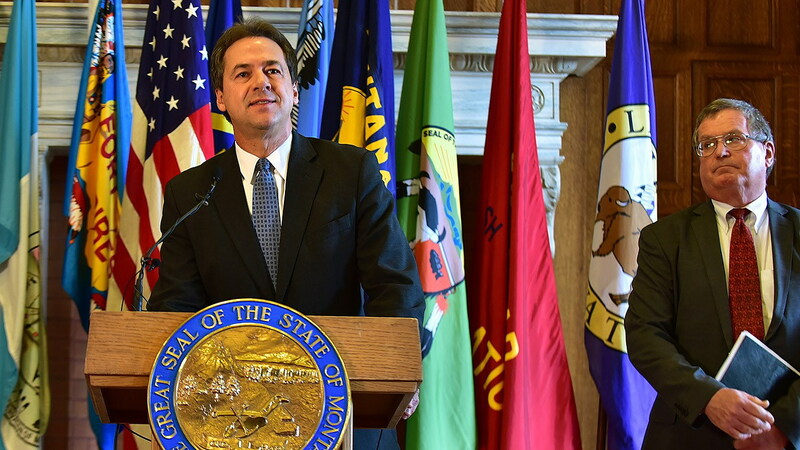 Other sizable portions of Bullock’s proposal include $1.4 billion in education spending and a $740 million allotment in 2020 for the Montana Department of Transportation. The governor’s aviation division — a comparatively small line item, but subject to perennial debate — has a $310,000 request. Renewing the expanded Medicaid program, which currently enables health-care coverage for an estimated 95,000 low-income Montanans, will cost about $704 million, according to an analysis by the Legislative Fiscal Division. All but $26 million of that would be covered by federal funding. Bullock’s budget also includes $10.3 million in new funding in 2020 for public preschool programs and $2.5 million in new spending for need-based university scholarships. To support those and other proposals, he’s asking the Montana Legislature to enact tax increases that would raise roughly $83 million a year, according to the Legislative Fiscal Division, with most of that revenue coming from higher tobacco and liquor taxes. How much of the governor’s proposal will remain intact after it passes through the legislative lion’s den remains to be seen. 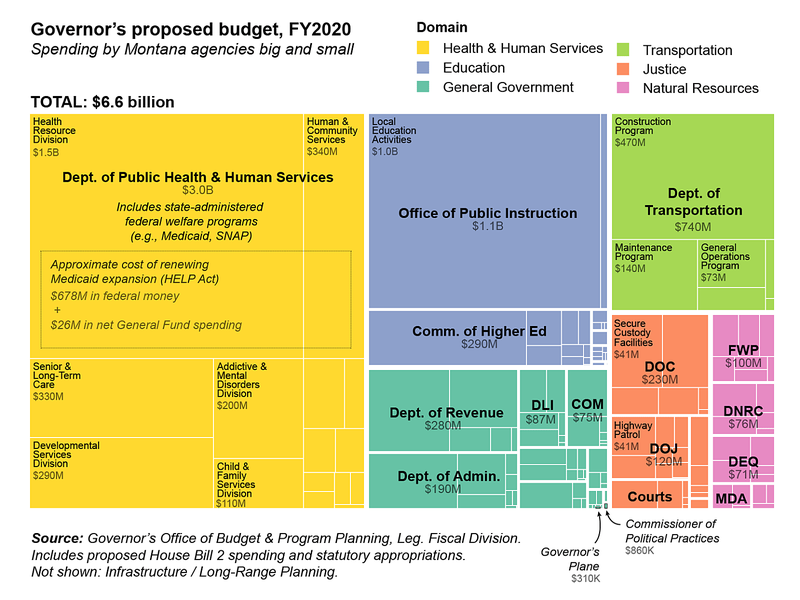 In the coming weeks, lawmakers on subcommittees dedicated to particular budget domains will scrutinize agency spending proposals, prepping for debate as the Montana House, and then the Senate vote on their own versions of appropriation bills. Eric Dietrich is an independent journalist and data designer based in Montana. This report originally appeared online at Montana Free Press.